Harry N. Abrams, 9781419723865, 288pp. Michael Ruhlman is the author of critically acclaimed books including Grocery, The Soul of a Chef, The Elements of Cooking, Ratio, and Ruhlman’s Twenty. He has collaborated on several bestselling cookbooks, including The French Laundry Cookbook, Bouchon, and Alinea. He divides his time between Providence, Rhode Island, and New York City. "Anyone who has ever walked into a grocery store or who has ever cooked food from a grocery store or who has ever eaten food from a grocery store must read Grocery. It is food journalism at its best and I’m so freakin’ jealous I didn’t write it." 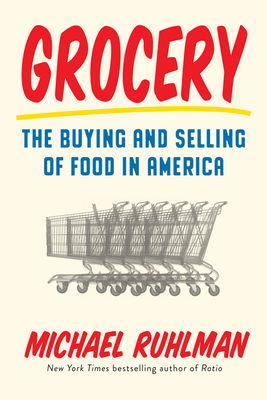 "As fascinating as it is instructive, Ruhlman's book digs deep into the world of how we shop and how we eat. It's a marvelous, smart, revealing work." "If you care about why we eat what we eat—and you want to do something about it—you need to read this absorbing, beautifully written book. It will change the way you shop."